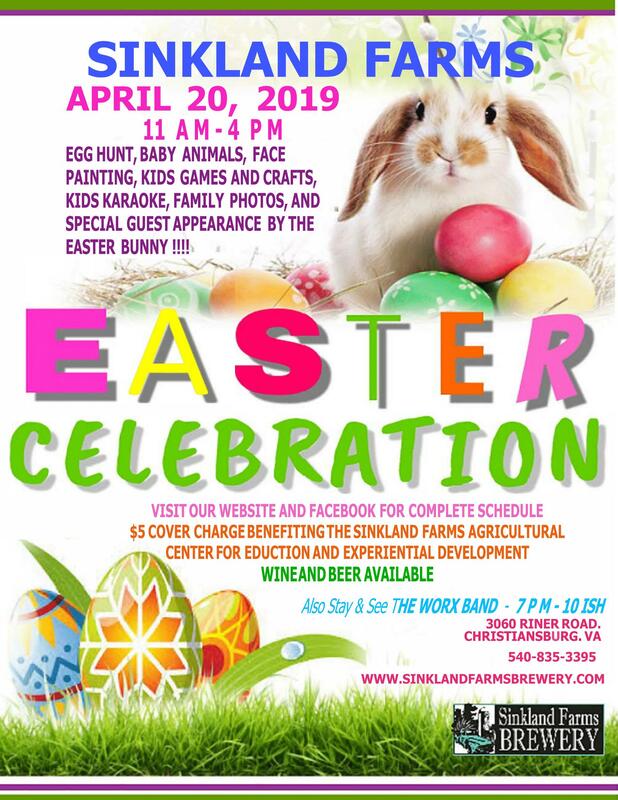 Sinkland Farms presents an Easter Celebration on Saturday, April 20, 2019. * Note: Times are tentative and are subject to change. Enjoy an Egg Hunt, baby animals, face painting, balloons, kids games & crafts, kids karaoke, family photos, kid's bingo, HokieTron and a special guest appearance by the Easter Bunny! There is a $5.00 cover charge to benefit the Sinkland Farms Agricultural Center for Education and Experiential Development. Ages 1 and under are free. Please bring your own Easter basket for the Egg Hunt. Wine and beer will also be available for purchase for those ages 21 and older. To view the event flyer, visit: https://i.imgur.com/ePwnYLb.jpg. For more information, visit: https://sinklandfarmsbrewery.com/event/family-easter-celebration/ or https://www.facebook.com/pages/Sinkland-Farms/399327097322 or call 540-382-4640.